As the ice returns to cover much of the Arctic coastal waters, Ocean Networks Canada's community observatory at Cambridge Bay marks its first year of continuous operations. In August 2012, the Nunavut Research Institute granted Ocean Networks Canada a five-year research license to provide real-time oceanographic data and imagery to study seasonal and long-term changes in the coastal ocean at Cambridge Bay. Its purpose is to provide science-based support for greater understanding of the fragile Arctic marine ecosystems. 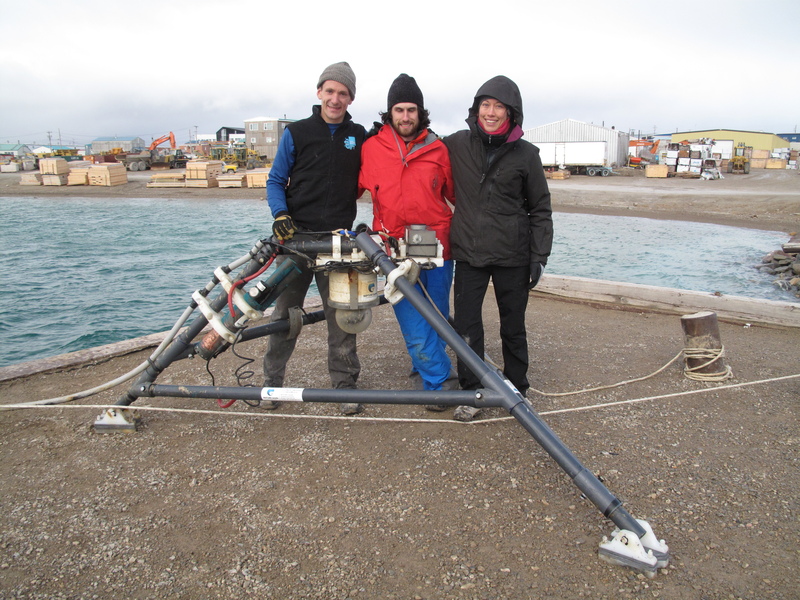 An ONC engineering and science team recenty travelled to the northern hamlet for the first annual observatory maintenance and improvement mission since the seafloor platform was deployed at the end of September, 2012. In addition to servicing the shoreside weather station and the data relay station at the nearby government buildings, the seafloor platform was raised to the dock for maintenance, instrument additions, and upgrades. These operations were supported by government staff and local contractors. The team also worked closely with UVic's Dive Safety Officer and a Canadian Hydrographic Service scientific diver to recover and redeploy the underwater platforms. Ocean Sonics icListen HF Hydrophone. VEMCO acoustic fish tag receiver to support the Dalhousie University's Ocean Tracking Network (OTN) program. New Ocean Innovation Centre (OIC) junction box to extend the number of possible connections with existing cable infrastructure. New Water Quality Monitor (CTD, Flourometer, O2 Sensor). New camera lights on the platform legs, with four new LED lamps. Repositioned video camera to increase unobstructed viewing of seafloor and direct uplooking views of water column and sea ice. Addition of seafloor ruler for scaling camera images. The dockside weather station has a new weather system, along with a barometric pressure sensor that will help better calibrate the measurements of the existing Ice Profiler, a key instrument on the underwater platform. The dockside video camera continues to monitor the southern horizon and sea surface (waves, ice), on a 24-hour basis. At the relay station, the newly installed Automatic Identification System (AIS) antenna and receiver will help monitor ship traffic in the bay and enable us to link underwater noise detected by the hydrophones to individual vessels. The Cambridge Bay Observatory has been streaming/sending time series data for a variety of ocean properties, including: ice draft, salinity, flourescence, air and water temperature, as well as video of life on the arctic seafloor. "The different instruments now installed at the community observatory represent different data types, produce different data rates and volumes that somehow need to be transported via satellite back to the data centre at the University of Victoria in near real-time. This is achieved thanks to the modular and scalable architecture of Ocean 2.0, the software system that serves the VENUS and NEPTUNE observatories." says Benoît Pirenne, Associate Director, Digital Infrastructure and project manager for the community observatory. These data are all available via ONC's Oceans 2.0 data management portal and SeaTube video archives. 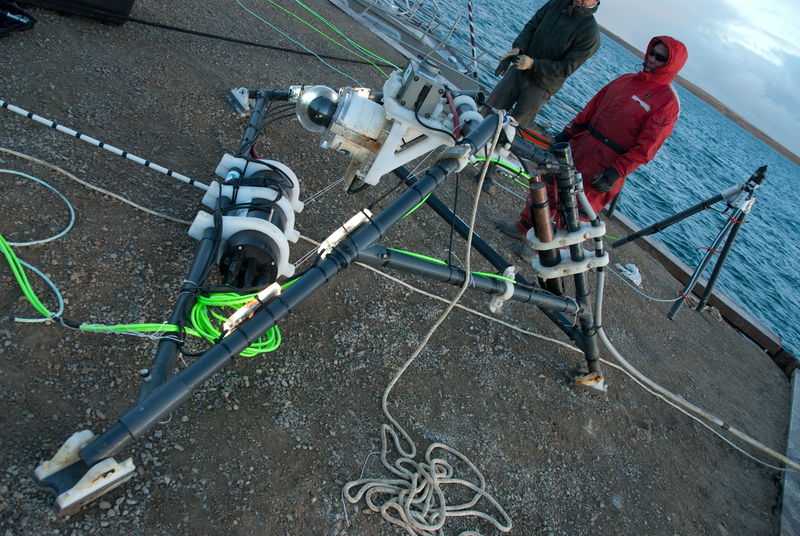 Two Canadian scientists with ArcticNet are now using/reviewing the seafloor data and video from the camera. Kim Juniper, Director of Science expects that this improved capacity and the second year of monitoring will build interest in the northern observatory, stating that: "Over our first year, we've been monitoring and watching the ocean seafloor and surface, testing the instruments in extreme conditions, and listening to suggestions and the growing interest from the research community." "In year two," he added, "we'll now be able to listen to the undersea sounds, and help track the movement of tagged animals or fish, and begin an inter-annual comparison of seasonal trends in seawater properties and ice growth." ONC's team to Cambridge Bay included lead project engineer Ryan Flagg and electrical technician Ryan Key, both returning to Cambridge Bay to work on the system they installed last year. They were joined by scientific data specialist, Alice Bui, who undertook biological sampling of species observed by the video camera. The team also met with the school and community to provide updates and formal presentations on the results produced by the community observatory over the past year. CBC's the National: "Only in Canada"
"A New View of the Arctic"
"Arctic Research Station Goes Global"